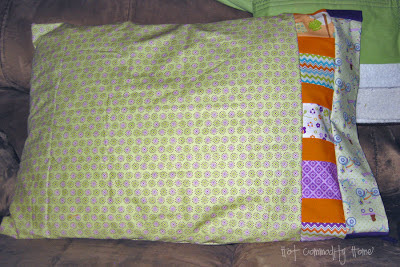 I ended up with a lot of extra fabric from the quilt I am making for my daughter, so I decided to whip up a pillowcase. Pretty simple project, right? 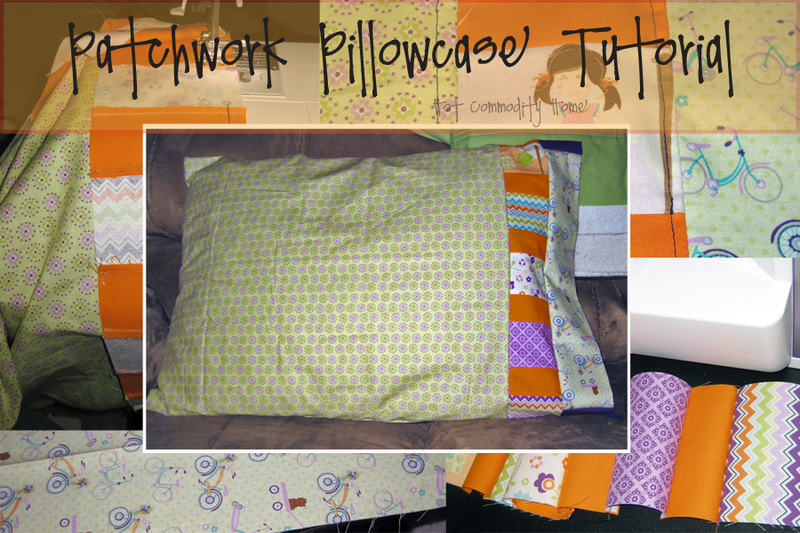 Well, I wanted to be able to use a lot of different fabrics on the pillowcase and I can't let anything be too simple. 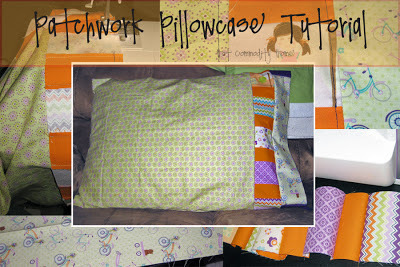 So I made it up as I went and created a fun patchwork pillowcase. 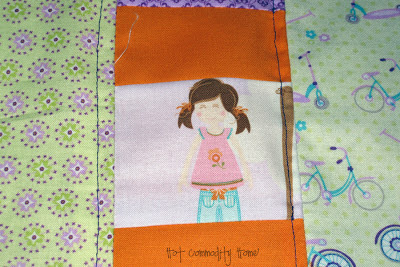 Gather your fabrics and determine which you will be using for the body of the pillowcase, the band of the pillowcase, and for the patchwork band. Start with the patchwork band. For mine, I used solid orange pieces between the patterned pieces. Cut your solid strips 2 x 4 inches. Cut your patterned pieces 3 x 4 inches. You can vary the sizes of these strips depending on how you want the final product to look. Just be sure to include 1/2 inch extra for seam allowances on each side. 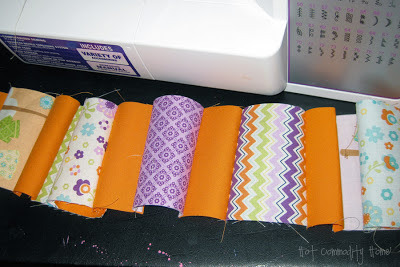 Sew your strips together with a 1/4 inch seam allowance, alternating patterned and solid. I didn't bother pinning since that would take longer than sewing. Just place your strips, right sides together, under your presser foot and let 'er rip! 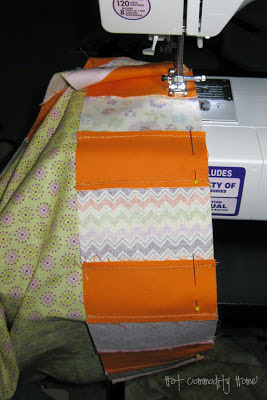 Sew all the strips together to form a long strip. A standard U.S. pillowcase is 21" x 30", so make your strip 21.5 inches long. Press all your seams flat. Place your folded band and your patchwork right sides together and pin. Stitch them together with a 1/4 inch allowance. 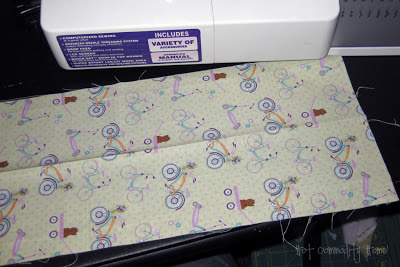 Turn wrong-side out and press seams flat. Stitch ends together to form a circle. 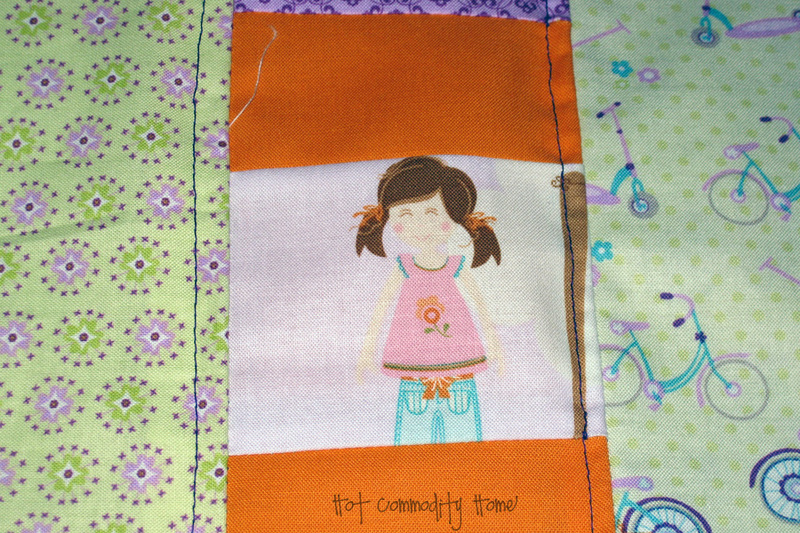 Pin the patchwork & band to the open end of the pillowcase body, right sides together. Sew all the way around. Press all seams flat. Top-stitch along the long seams for a nicely finished look. Put it on your pillow and enjoy! I really like this idea...it's totally customizable to anyone's taste or décor. Great idea! Thanks Christine! I'm glad you like it. I was excited that I had enough extra fabric to make it to go along with my daughter's quilt. Now whenever she gets a big bed, it'll be all matchy matchy! Thanks for stopping by! BTW I noticed you're reading Wildwood. Do you like it? I've been itching to pick it up, but I have so many others to read. I barely started Wildwood. It was recommended to me by a friend, but I haven't had time to really get into it. Hopefully now that my quilt is done I will have more reading time! So cute!! I'm glad you visited Romance on a dime and linked up! Thanks for linking up at Romance on a dime!! Thanks Betsy! I am glad you stopped by and commented. I'll be joining your party every week hopefully.